We don’t really see much of Jim Carrey nowadays, but in the mid-90’s the actor was everywhere. His breakout year came in 1994 when he starred in three incredibly beloved comedies: Ace Venture: Pet Detective; Dumb and Dumber and The Mask, loosely based on the comic book series published by Dark Horse. Not one to miss out on making a game based on a popular IP, THQ commissioned a game based on the film inspired by a comic, though it wouldn’t arrive until a little over a year and a half after The Mask ended its theatrical run, something pretty uncommon for publishers like THQ and Acclaim as they normally got their games out in the same year as the license they intended to cash in on. 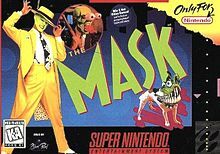 With all that extra time to build a game not attached to a theatrical deadline release date, is The Mask on SNES worth your time? Maybe, but only if you’re ssssssmmmmoookkkiinnn’ …moving right along. The film of the same name told the story of average, boring, nice guy Stanley Ipkiss who stumbles across an ancient mask that turns him into a green headed living cartoon capable of amazing feats. In trying to use his new-found power to impress Tina Carlyle, the girlfriend of a powerful mob boss Dorian Tyrell, Ipkiss not only must control the urges of his outlandish alter ego, but protect the artifact from being used by dangerous gangsters who would use the mask for their own malicious purposes. Don’t expect any of this to be communicated to you within the game based on The Mask, as there’s no story set-up whatsoever. The second the player hits start they’re thrown right into the game and if its supposed to tell the story of the film, it does a poor job. 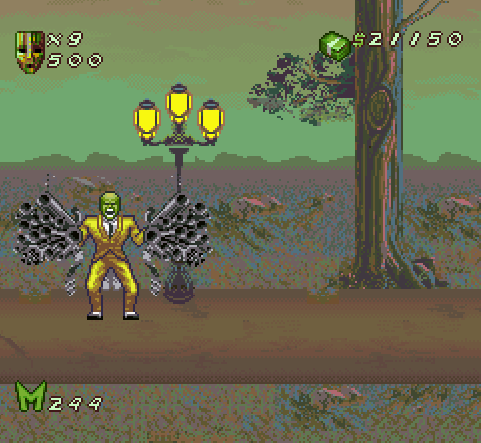 As already stated its been many a year since I’ve seen The Mask in its entirety and the only things in the game that stirred any recollection of the movie were Stanley’s land lord as a boss in stage one, and the last stage set in the Congo Bongo night club where you fight Dorian, who’s wearing The Mask…while you’re wearing The Mask? It doesn’t really make much sense. Even if you haven’t seen the movie or just haven’t seen it in a long time, what you’ll probably remember most is the wacky antics of the title character and Black Pearl, the developer of this game, did a very good job of capturing that in 16-bits. While either running, sneaking, super jumping, crashing into the ground like Wile E Coyote or using your over the top morph powers, there’s a lot of personality in The Mask’s sprite and you feel like you’re really taking the reins of an out of control cartoon character. That however, is really where the compliments to this game end. The Mask is another one of those dreaded no continues, start over when you run out of lives games and starting out, I found this game pretty difficult even on the easiest setting. That was until I stopped trying to use my decently varied arsenal and switched to exploiting the best pro-tip I can offer: hold down the L trigger and run back and forth punching like a mad man until your oppositions stops standing. Your moves take inspiration from things the character did in the film. 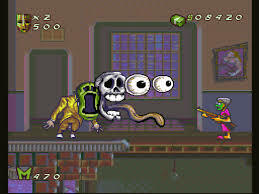 Your standard attacks are a punch and an overhead mallet, both of which can be modified when holding up on the controller for more powerful attacks where The Mask will either pull out a horn or an obscene amount of machine guns and hit everything on-screen or turn into a Tasmanian Devil-esque tornado. These moves don’t serve much purpose within regular stages, as you can either run past everything or just unleash a flurry of punches, but they come in handy when fighting the bosses that appear at the end of all but one level. That being said, your basic attack combined with running around like a lunatic is a pretty sound tactic for all but the last boss as well and it’s also the only one that doesn’t drain your morph power meter. For some unknown reasons Black Pearl implemented a sneaking function where your character walks around like Bugs Bunny trying to sneak up on Elmer Fudd, but I found no practical use for this other than it looks kinda funny the first time you do it. This is a fairly short game with just six levels and once you get the hang of things you can complete the entire game in under a half an hour. They offer a decent amount of variety as no two levels are the same, but they fall into some fairly stereotypical themes like a jail, construction site and sewer. The levels themselves are not linear point A to point B affairs and they encourage you to explore them to hunt for extra lives, which are very important as again you have zero continues, and your dog Milo who increases your health and ability to use your modified moves. While it’s great that Black Pearl crafted levels are designed to be more open than most games of this type, they also lack any direction. It’s sometime easy to get lost, especially in the sewer stage that has a lot of false exits. The game also fails to teach you one of its most important mechanics: the ability to warp through vents and pipes by hitting up next to them, and not long after starting out I found myself stuck until I accidentally discovered I could do this. The enemies that populate the stages also aren’t that much fun to fight and annoyingly push you back when they hit you. This is a compounded annoyance when in levels where you have to traverse vertically, but to the games credit, they never position an enemy next to a platform that will cause instant death. 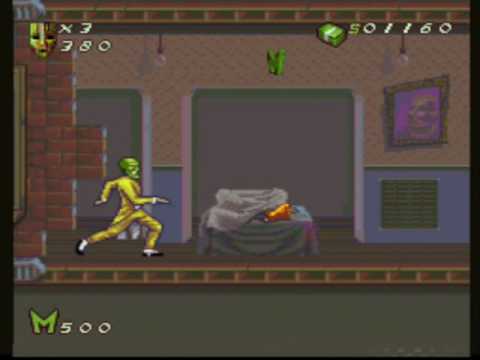 The Mask had some pretty memorable music from jazzy club music to the “Cuban Pete” dance number but this game features none of those memorable tunes, which is a disappointment. You can’t even blame the hardware as the Star Wars and Konami Batman games, also on the SNES, had excellent renditions of their respective theme songs within their games. As far as movie or comic properties that can be turned into games go, The Mask isn’t that bad a choice. The character’s larger than life movements and powers are a great fit for a video game, something Black Pearl did an okay job of representing in this game, but style will only take you so far. With a better soundtrack, level direction and more excuses to use your creative powers, this game could have easily broken the 16-bit licensed game curse, especially as it came out much longer after the movie it was based on came out. With a half an hour’s worth of play time and little replay value, The Mask doesn’t so much smoke as it does mildly sizzle. WHAT WOULD AN SNES CLASSIC EDITION OF NOTHING BUT COMIC BOOK GAMES LOOK LIKE?